The Dark Angels are coming, the Dark Angels are coming! Okay, by now, we have all seen the pictures of the new Dark Angels models hitting the shelves next week. In the January White Dwarf, there is a 80 billion step walkthrough on how to paint bone armor. Well, after the wifey saw the DW Knight models, she expressed an interest, and up until now, I have always hated painting Bleached Bone armor. 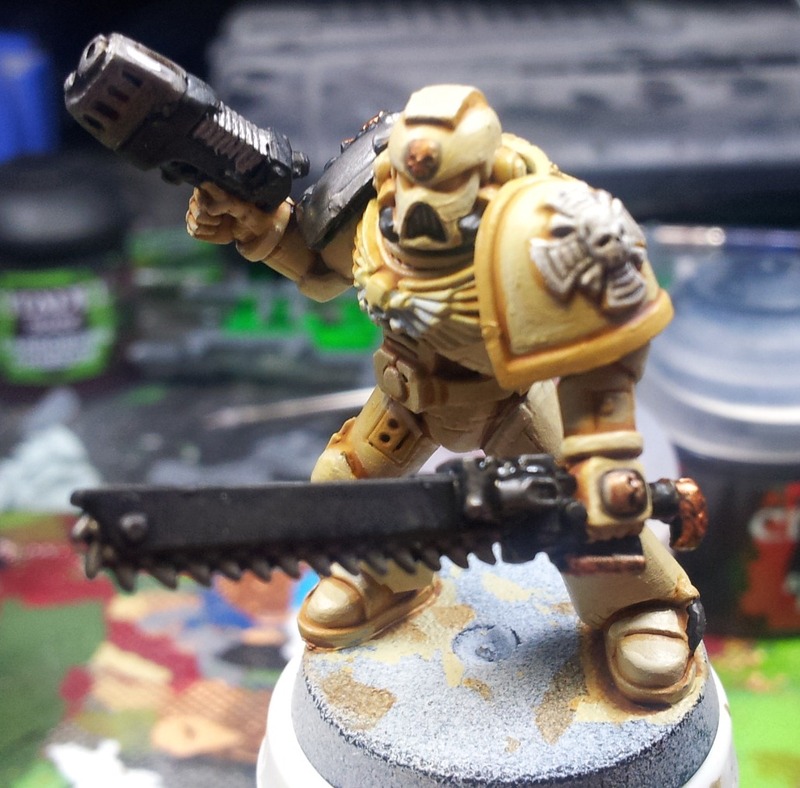 Step 1 - Prime White or Army Painter Bone. 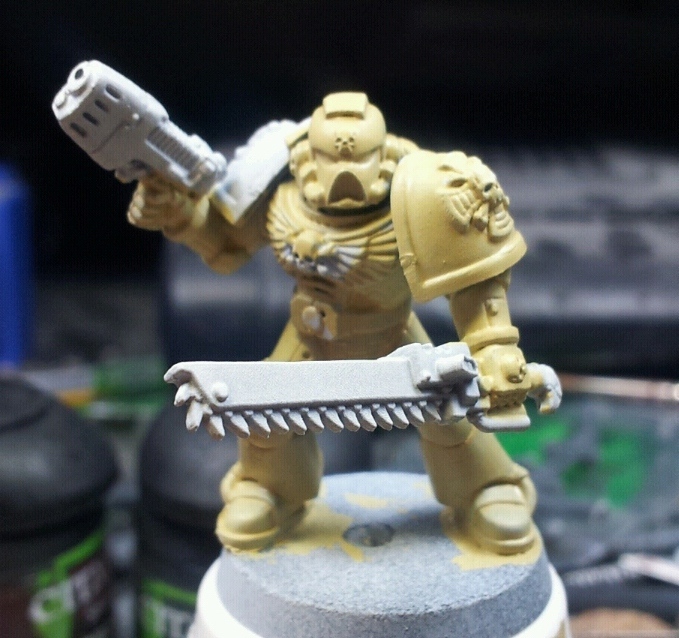 I personally prefer priming in black, but with an overall bone colored model needs to be primed in a light color. You could use the Army Painter Bone color, but since it will not dry rough, the initial coat will not take a wash very well, so I went with a white primer instead. Step 2 - Base coat a very thin coat of Ushabti Bone (GW). 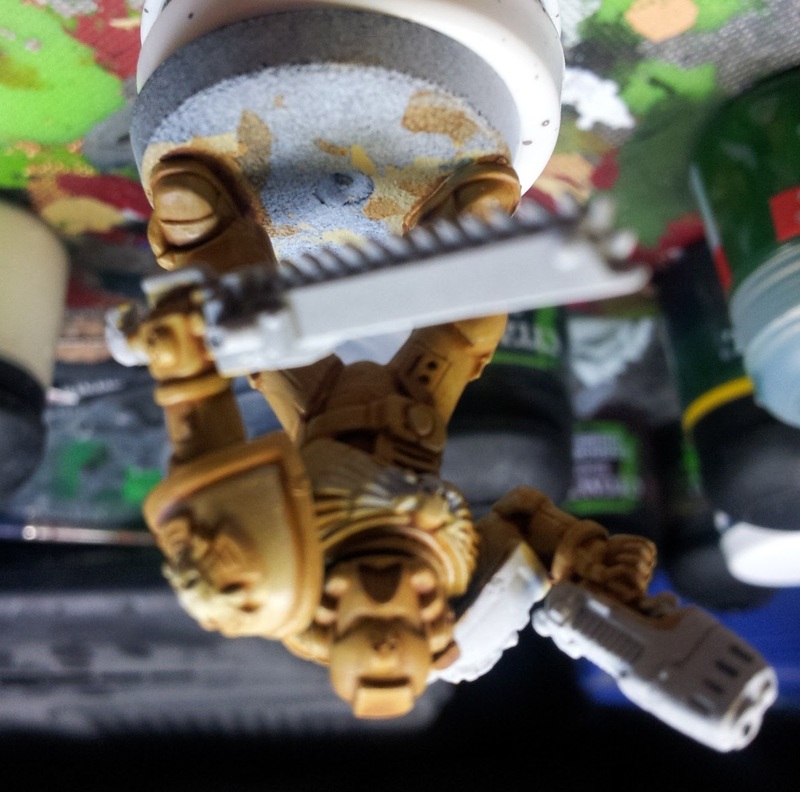 For mine, I used Menoth White Base (P3), as it has a richer tone than the Ushabti. 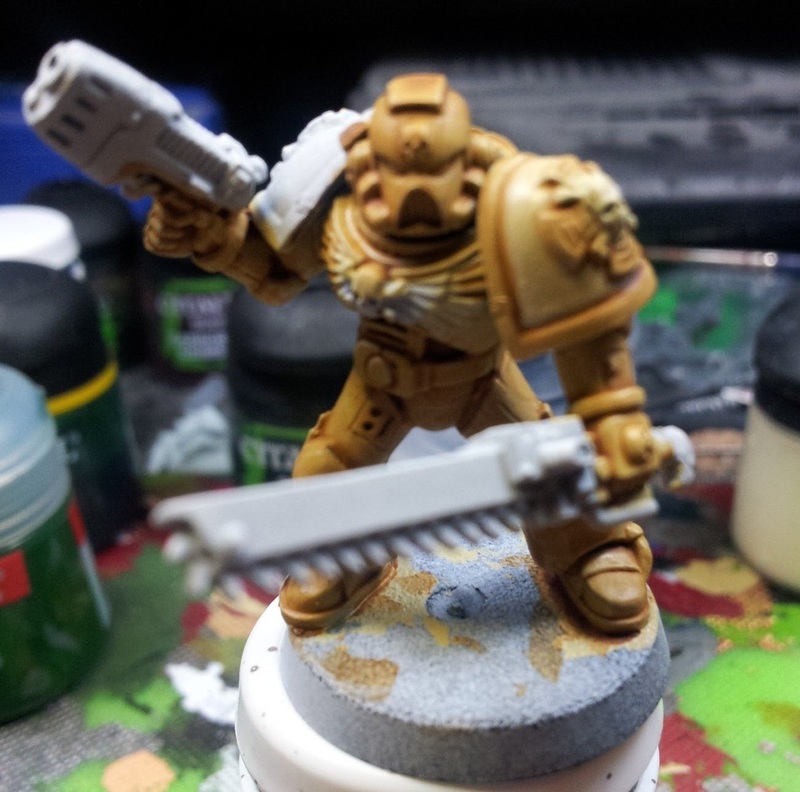 Step 3 - Water Seraphim Sepia 2 parts water, 1 part wash, and wash the bone areas of the model. Once this is done, use a straight wash between the major armor plates. Let this dry, and then re-coat the bone. With a 50/50 mix of white and bone, highlight the edges. At this point, the bone is all done. Step 4 - Black (Abaddon Black GW) out the areas that will get metallics painted on them. 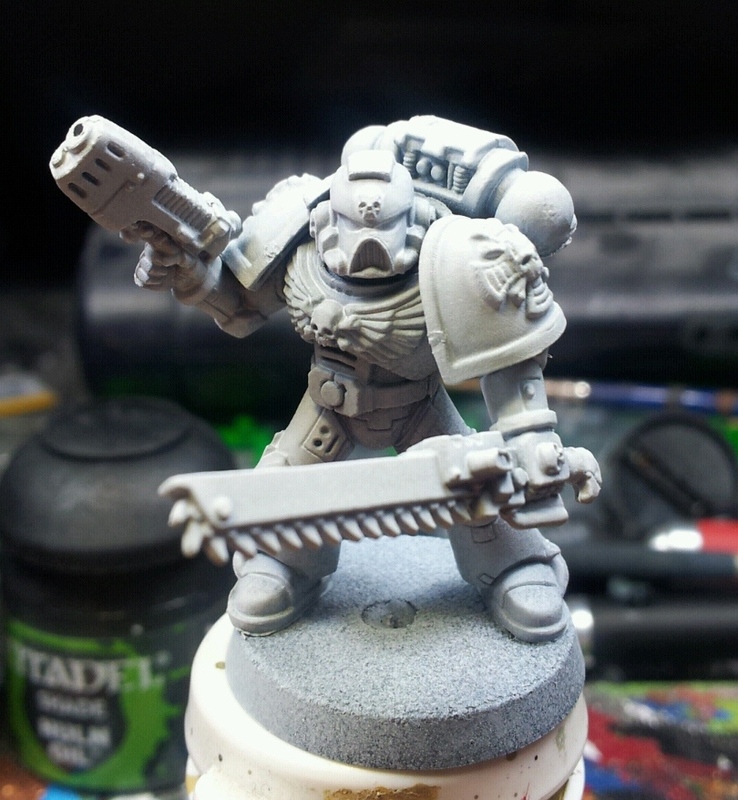 In this models case, the entire right shoulder pad is blacked out, as it is a Deathwatch pad. 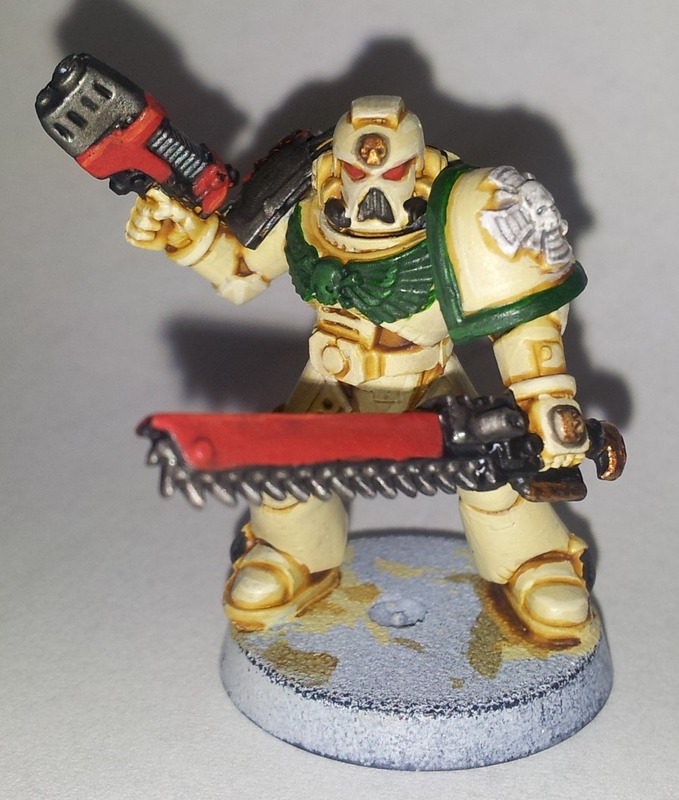 The left pad has a Crux Terminatus, signifying a veteran, so this was painted in White Scar (GW). 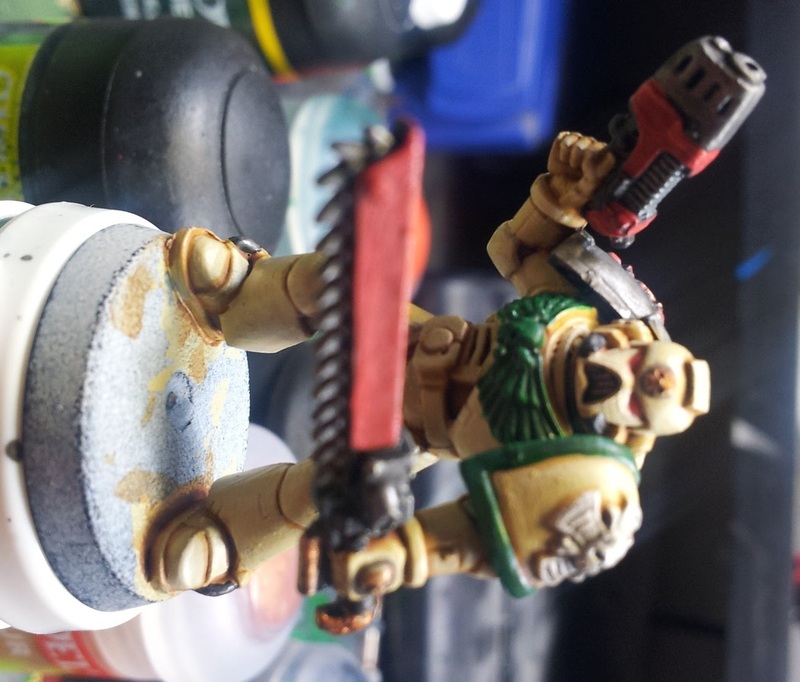 Paint Leadbelcher (GW) or a gold/bronze over desired areas and wash with Nuln Oil (GW). I create a watered down grey wash, using Dawnstone (GW) by mixing 4 parts water, 1 part paint. I threw a dab of Nuln Oil into the grey wash to get some settling agent in it, and then washed the Crux. Step 5 - Using a three stage red highlighting process, I painted the pistol and chainsword casings, starting with Skorne Red Base (P3), then Khador Red Base (P3). I used Evil Sunz Scarlet (GW) as the final layered, color, and then edge highlighted with Troll Slayer Orange (GW). This red was then washed lightly with Carroburg Crimson (GW). I painted the eyes with a 2 stage red -Evil Sunz Scarlet, highlighted with Troll Slayer Orange, ending with a light Carroburg wash. The chest eagle and shoulder pad trim were painted in Caliban Green (GW), highlighted by Iosan Green (P3), washed with Biel Tan Green (GW). 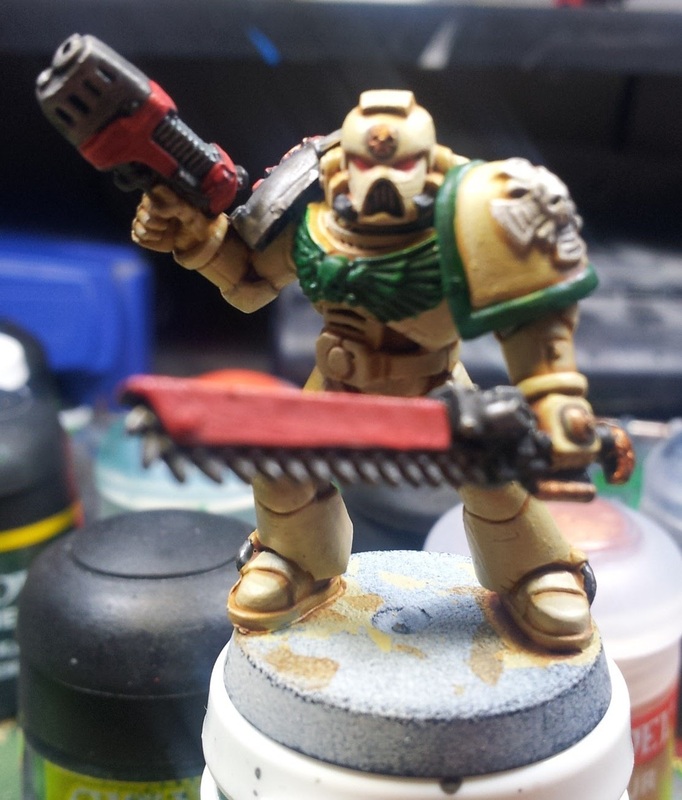 Final Picture, but still without a backpack, as that will be painted separately. It sounds complicated, but is really simple. I really enjoyed painting this guy, and look forward to cranking out some DW terminators soon.